One of my favourite products from one of my favourite brands celebrates it's 25th birthday this month. 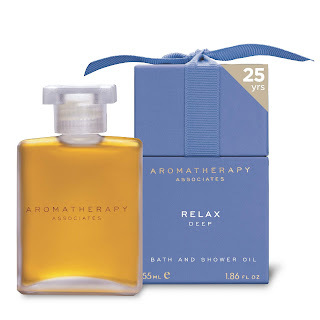 It's hard to believe that Aromatherapy Associates Deep Relax Bath & Shower Oil has such a heritage- it feels so modern and relevant today and I wasn't in the least surprised to learn that the award-winner remains the brand's bestseller. The oils are truly luxurious with an undeniably high price to match (£36 for 55ml). If you're yet to invest, there's a special incentive this month to celebrate the landmark quarter century birthday. Pictured below is the free gift worth £25 which Aromatherapy Associates are gifting with every purchase of the oil (until the end of January- please refer to their site for full T&Cs). I'm a HUGE fan of the Revive range and think this is a fantastic opportunity to try a variety of products before parting with your cash (which I warn you, you will want to do after trying!). The ritual of using the Relax oil before bed and Revive in the morning is wonderful, particularly if you struggle to sleep. "Lavender is always widely considered as being the best essential oil to help induce restfulness. In fact, Vetivert, when included alongside Camomile and Sandalwood is far more effective at helping aid a good night's sleep. Use the oil in the shower by applying a small amount to the torso before stepping under the hot water and inhaling the blend with a few long, deep breathes. Place a few drops of Deep Relax in a bowl of hot water next to your bed- the aroma will help instil a restful night's sleep. Apply a small drop of Deep Relax to pulse points on each wrist, hold the hands over the face and breathe deeply for a few moments before lying down to sleep. Taking a few minutes to focus and calm your busy mind before sleeping will lead to a healthier, deeper sleep, allowing the body to repair, helping to increase your immune system and benefitting the body, both mentally and physically." Would like essential oil! It is very effective in reducing itching and irritation. This makes it good when dealing with lesions, rashes, eczema and insect bites. This promotes hair growth and improves the condition of the hair.